These extra large signs are not kept in stock at Spiderwebart Gallery, they will be drop shipped from the manufacturer. Because of this, the signs ARE NOT signed by Greg Hildebrandt. Greg Hildebrandt’s American Beauties series has just been released as vintage tin signs. These fabulous vintage collectibles measure approximately 24-inches by 36-inches and weigh 10lbs each. Unlike most tin signs, they are designed and made in the United States using 24 gauge American steel and a process known as sublimation, where the image is baked into a powder coating for a durable and long lasting finish. A vintaging process is then performed by hand to give these signs an aged look and feel. Each sign is drilled and riveted for easy hanging. 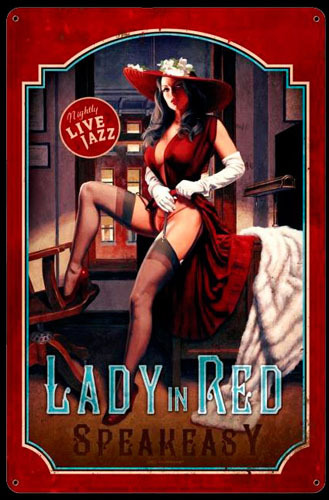 This is a great collectible to give as a gift or for your own Pinup/Hildebrandt Collection.